The next version of Apple's iPhone software will not only introduce Street Views to the handset's Maps application, but also provide bus, train and walking directions, a series of new photos reveal. iPhoneYap has posted an extensive screenshot gallery from iPhone Software 2.2 beta 2, released Friday, which offers a walkthrough and detailed descriptions of the new features. When set in Directions mode, Maps now offers three icons —car, public transit, and walking — centered at the top of screen, in between the "Edit" and "Start" buttons. Selecting the transit icon provides a list of transit choices that can include subways, buses, or a combination of the two. A list of departure times and estimated commute times accompany each transit option. Once you select a particular method of transit, the Maps application will serve up step-by-step directions from your current location, usually directing you to your chosen departure subway or bus stop on foot. 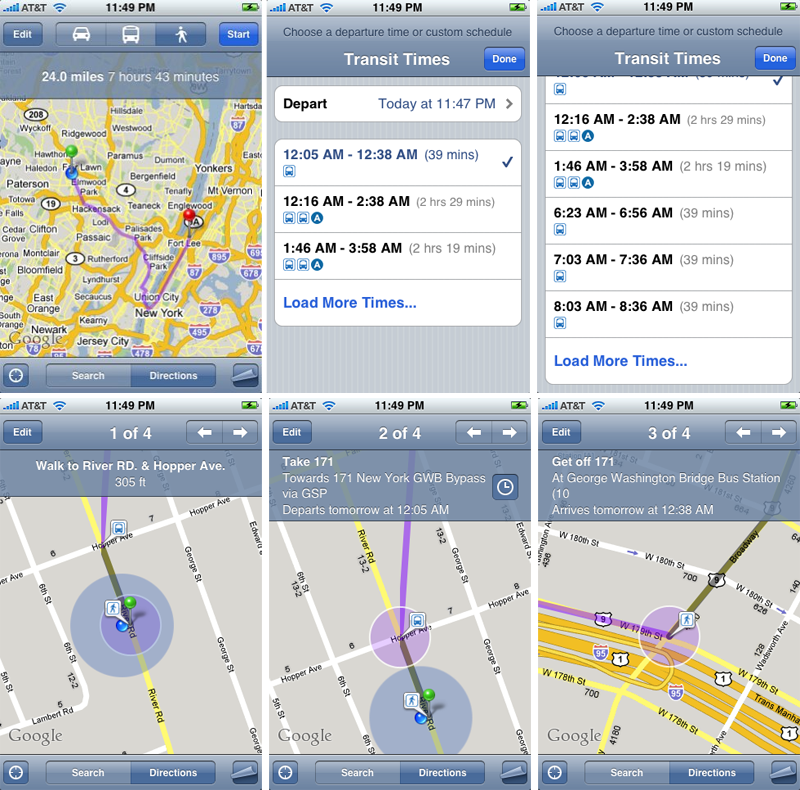 During commutes, Maps will specify when you should board or disembark from a bus or train. 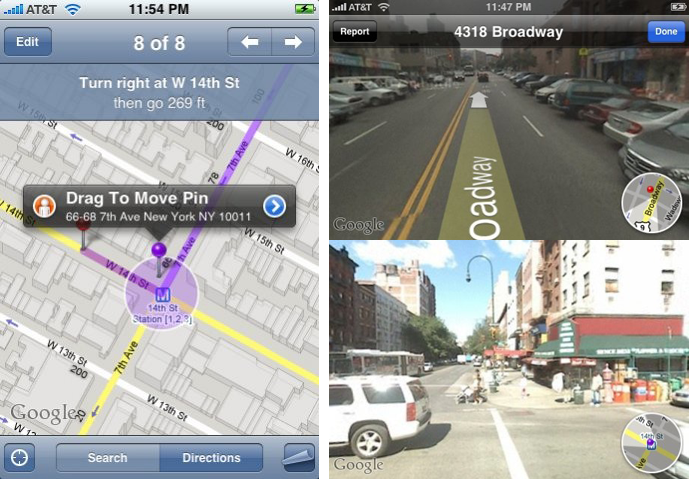 Meanwhile, Street views on the iPhone will let you view street-level photographs, just as they would at maps.google.com. To activate the feature, iPhoneYap reports that you simply need to "drop a pin or click a searched location to get the tooltip to popup from the pin." The tooltip popup then serves as a gateway to the Street View interface. Once in Street View, you'll notice two options in a bar at the top of the screen: "Report" and "Done." A small navigation circle showing your current location (on a map) overlays each Street View photograph. One final feature noticed in the new version of Maps is location sharing. 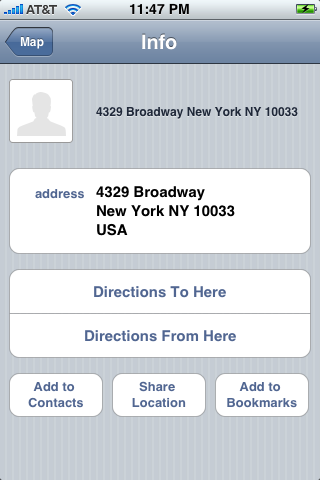 Selecting the "Share Location" option of an address will auto-fill an email with a hyperlink to the location, which will automatically launch and load in Maps application of the recipient, assuming they too have an iPhone.